Classroom Webinar Review for the September 1-3, 2017 PT licensure examination in the Middle East! Aiming for that PTRP license? 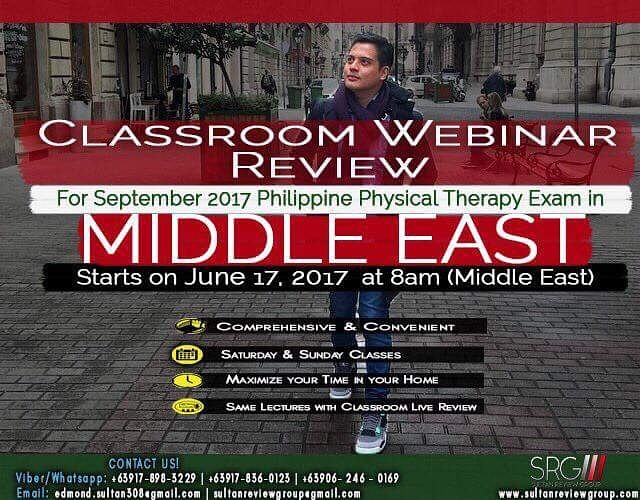 Enroll now and join SRG’s special LIVE Classroom Webinar Review Program for the September 1-3 2017 Philippine Licensure Examination for Physical Therapist in Saudi Arabia, Qatar, UAE, Oman, Kuwait and Israel. The most comprehensive, innovative, results-oriented online review program that has produced numerous passers and topnotchers in its previous seasons! The Review will start on June 16 and will be conducted Fridays and Saturdays only, 8-5pm (Middle Eastern time). Previous Entry:LIVE Classroom Webinar Review for September 1-3 2017 Local PT-OT Board Examination in the Middle East! *Enrollment only until May 31! Next Entry:Intensive Worldwide Webinar Review Season 6 for the NPTE, PCE, and NPTAE!